There are many hotels and guests houses around Hawa Mahal. The closest one is probably the Umaid Vilas, one of the heritage style Umaid Residency. The location is unbeatable and they are the Travellers’ Choice from Tripadvisor in 2011 and 2012. Read on for more hotels near Hawa Mahal. Jaipur has many palaces and big mansion and a lot of them are converted to hotels. One of them is the Jai Mahal Palace Hotel which belongs to the Taj Group. 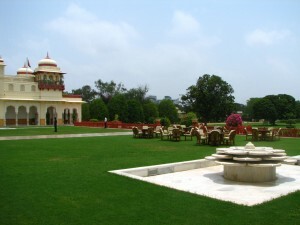 Situated in the 18 acres Mughal style Garden of Natani, the palace was converted to a hotel in 1955. It provides true luxury and it’s the most authentic palace adaptation of the kind. Also great venue for weddings or corporate events . More on the luxury side, the magnificent Rambagh Palace Hotel and Samode Haveli Hotel are the other choices. If you are not looking for surprises and just want something safe and reliable then you will probably want to turn to one of these international hotel groups which you know they reach certain standard. If you are travelling in tight budget, you may try Pink Turban, Hotel H.R. Palace, Shahar Palace Hotel or Madhav Guesthouse. Homestay is economical and it can be a total different experience from staying in a hotel. Check here for a list of Rajasthan authorized hotels, guesthouses and homestay.